And once more I am amazed by the different afterwork activities London is offering. This time, Selfridges has united with Magnum for their 25th Anniversary celebration and opened a pop up bar at the department store. What are they offering? To celebrate Magnum's 25th birthday, Selfridges is exclusively hosting the Make My Magnum experience. Which means you will have the chance to create your very own personalised ice cream at their Make My Magnum Bar. You'll have to pick your favourite ice-cream flavour (vanilla or chocolate-caramel), a chocolate coating and a choice of 17 toppings (of which you will have to pick 3) to design your ultimate Magnum. For thos into Facebook, Twitter, Instagram...you'll have a change to get an extra topping if you create your own virtual Magnum while you wait to get yours in store (through the Make My Magnum App). Also, by uploading a picture of your creation through any social media platform and writing #MagnumXselfridges you'll automatically enter into a draw to win a year's supply of Magnums and a £250 to spend on Selfridges! How good is that? 2. It's only 4,5o pounds to create you own magnum and you get to experience something quite unique. The staff is very friendly and the location is marvellous. The Pop Up Bar is full of golden ballons and everything magnum, which you'd never get to see anywhere else. 3. Do you need more reasons? When can you go there? 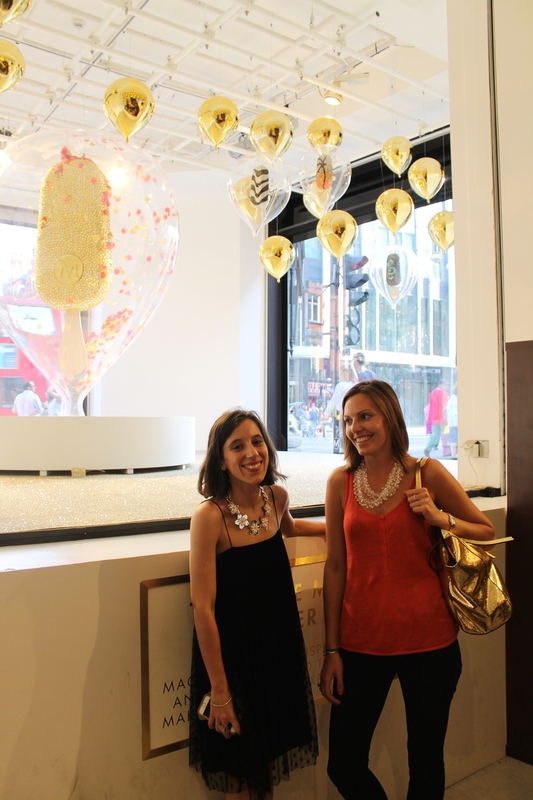 You'll have a chance to create your own magnum all summer long at The Concept Store in Selfridges, until the 30th of August. My Magnum creation is made of: Chocolate-Caramel icecream, whice chocolate coating and 4 topings: sea salt, koji raspberries, smashed meringue and crashed biscuits! I'm Wearing S/S 14 Zara dress and Topshop necklace (oldie). Olivia is wearing necklace and tote bag from Zara as well.